Is Ferrari's Fernando the best on the grid? 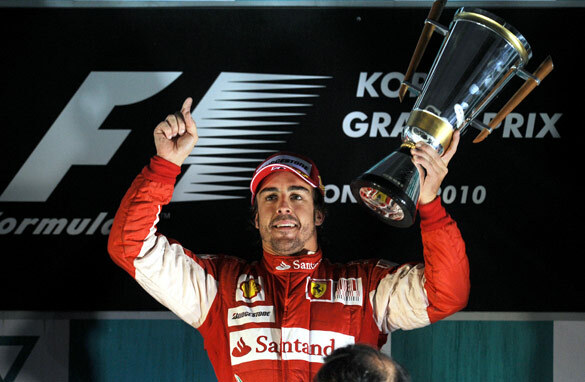 Fernando Alonso celebrates after winning the first ever Korean Grand Prix (Getty Images). As a thrilling Formula One season hurtles towards the finishing line, Fernando Alonso sits in pole position for the world championship with only two more races to navigate. The Spaniard can seal a third world championship at this Sunday’s Brazilian Grand Prix after his consistency and late-season form have propelled him to the top of the pile. It is hardly surprising that a driver of Alonso’s standing is now within touching distance of Formula One’s grand prize, it is the minimum requirement when representing a team as rich in heritage as Ferrari. But it is a credit to his ability as a driver that he has been able to overhaul the super-fast Red Bulls of Mark Webber and Sebastian Vettel, clinching a victory last weekend after the Australian and the German both failed to finish in Korea. When all the technology is stripped away, the cars removed from the equation and the legions of mechanics and technicians cast aside, is Fernando Alonso the most naturally gifted driver on the Formula One circuit? Simon Arron, motorsport correspondent for British newspaper The Daily Telegraph, believes the two-time world champion has an undoubted gift for driving. “All the evidence points to a guy with enormous natural talent” said Arron. “He reminds me of a terrier, he’s absolutely relentless. When he’s got his eyes set on something he just does not let go and over the course of a race his pace is absolutely relentless. Alonso’s most recent victory, in the mentally-draining marathon that was Korea, is testament to his ability to stay focused when all around him seem to be falling apart. Despite the considerable intervention of the safety car, the retirement of his Red Bull rivals and the torrid conditions, the self-assured championship leader was able to keep his head and guide his car over the line in first place. In stark contrast to his young German rival Vettel, Alonso has also managed to convert strong qualifying performances into wins on a Sunday. The 23-year-old Red Bull driver has wracked up nine pole positions so far this season, but has only twice managed to win when starting at the front of the grid. There have been no such problems for Alonso, who seems to relish the expectation that comes with pole position, transforming his three poles into three grand prix wins. The 29-year-old has also shown his supreme capacity to produce his best performances under pressure. His recent run of three victories in the last four races has shown how he is able to find something extra when the chips are down, and as in-fighting engulfs Red Bull, Alonso has made a B-line for the top spot. Even the burden of carrying Ferrari’s legendary name has not weighed him down; he joined a list of drivers including the likes of Juan Manuel Fangio and Nigel Mansell when he managed to take maximum points on his racing debut for the Scuderia in Bahrain this year. All in all, he seems to have all the attributes required in a champion, grace under pressure, the heart for a fight and an undisputed will to win. So with two races left, Alonso has an excellent chance to complete a hat-trick of world championship triumphs, and after one of the most open title races in history, it looks like the talent will rise to the top. In a word, no. Here's why. The world champion must be gauged on winning the title on merit, not because of the misfortunes or mistakes of the other drivers and teams. For sure, he is a great driver. But really, they all are at that level. From what i can see, the last few weeks have been filled with disaster for Red Bull and Maclaren but the Ferrari seems to be in a rich vein of fortune. Sure, to win any title, one needs a certain amount of luck, i admit that. It will be very interesting to see what happens in the last 2 races. I would agree though that Alonso has done very well to put himself and the prancing horse in contention, especially given their dismal early season form. Finally, i would say that what would make the decision of who is the best driver a lot easier to gauge is if all teams ran the same engines and set ups. For years, fans all around the world know that really, the winner is the one with the best and most reliable car. No Alonso is not the fastest most talented driver currently in Formula 1. His true level of talent was exposed by Lewis Hamilton then a rookie. All Alonso could do was whine and blame the McLaren team for his second rate pace. Alonso is a fantastic driver, and winning two world championships just proves so. But as with everything in life, there is a component of luck, and he had it in Korea while Red Bull did not. We shall see what happens in the two remaining races of this fascinating F1 season. As good as he is, if he wins the championship this year it will carry the painful stain of Ferrari disobeying the "no team orders" rule. And because of that I would much rather see someone else win. Alonso is not, cannot and will never be the best on the grid. He is by far the luckiest driver on the grid! He has so few wins this season, yet leads the championship. Alonso would also not be where he is, if not for a more than obvious team order to his team colleague. Take a look at some of the other drivers who push the car harder during qualifying and start of better than him. However for technical reasons they were unable to finish the race or score better. So yes, the Ferrari is a stable ride, which does not require a champion driver. That is exactly what Fernando Alonso is – an average driver with a huge ego, who is taking too much credit for the little that he did. I agree. If you take a look at most of his victories, they all come after the race leader retires or makes a mistake. Let's face it, Alonso doesn't have the supreme talent everyone says he does. He just waits for driver errors to get an easy win. some compare him to Senna and Schumacher but I don't put him in the same league. Mainly because they dominated races and their rivals. Yes, of course, he is the best driver on the grid for many years. And I hope he wins the championship. Olé! Alonso!! I am not surprised that nobody has bothered to write a comment on this heap of drivel. One can be "the best driver in the world" (sic) but your team of mechanics and technicians is not up to much so one doesn't win races. Putting Alonso up on a pedestal is about as ridiculous as underwater smoking, and the same goes for most other "great" sportsmen/women over the years. Yes, of course, he is the best on the grid, and I hope he wins this championship. Olé!!!! Alonso!!!!! you are the best. Alonso is definitely the best. He gets alot of hating in English-speaking countries because of his troubles with Hamilton. Everything he does gets blown out of proportion. But it is plainly isible to all that when Alonso grabs a car, he can make it run better than anyone else out there. Look for Alonso to match atleast Fangio in world titles. Alonso is undoubtedly a gifted and brilliant driver but is far from the best of the current crop of drivers. That accolade falls on the younger and much more versatile Louis Hamilton. Don't forget these two young drivers were in the same team only three years ago, driving the same car with exactly the same technical support. Plus, Hamilton was a rookie in his first season and Alonso was the double world champion. Guess who was left far in the shade... In the current season, Hamilton has has to make do with an obviously inferior car with persistent reliability issues but has remained in contention and only 21 points adrift even at this stage. With a car like the Ferrari or Red Bulls, this guy would be far in the distance. No; Hamilton is head and shoulders above the rest. It would appear that his win in Korea was a result of orders to his teammate to let Alonso win!! A situation against the rules and should have resulted in his disqualification!! Too bad that these articles don't tell all the facts. If he is so good why is he sitting in fourth position on the grid? True Alonso may have a natural talent for motor racing but he is far short of being the best on the grid just look at his year at Mclaren, his lack of team building skills his distructive attempts to destroy a team that would not grant him the number one status he believed he deserved. Only at a team like Ferrari could Alonso hope to replicate Schumacher. Sure he may be fast but he is no where near a complete driver. When Schumacher was dominating F1, there were still people who didn't believe he was the best on the grid. Some said Montoya was better, others pointed to Hakkinen and Villeneuve. Some even said Damon Hill was the cream of the crop! Everyone is bound to have their own opinion as to who the best on the grid is, so this is potentially a very silly debate to have. I am not convinced that Alonso's will to win is necessarily superior to Schumacher's or Hamilton's (results do not equal will to win). Same goes with being the most "naturally gifted", but that's just my opinion. At Monaco, many people were pointing out the number of mistakes he was making. If not for mechanical failures, this article would probably have been about Vettel instead. If he wins the championship, he will be the champ. Period. Same as Button last year, whom I guess few would have considered the best on the grid last year (or this year for that matter). Right now, there are still 3 drivers in it (4 mathematically if one includes Hamilton, although it is a long shot). Let's wait and see what happens. @ Dave: Alonso had 2 world championships at that point and Hamilton was a newbie, so yes, I believe he deserved the number one seat until the puppy could have proven he is consistant. Apparently he wasn't judging from his mistake at Brazil in 2007, hmm? @ Jk: Agree, Hamilton was MUUUCH faster than alonso in his first season, but then again, who managed (like vettel) to fallout the most? F1 is not about being the fastest, every single lap like Raikonnen in the beginning, or Hamilton or Vettel, its about being consistent and knowing when to push and when to sit back and bring in a 3rd place for point. Alan Prost won most championships coming in 2nd place, check the stats. Regarding team order: Who cares?! Shumi, Prost, Senna, Mansel etc etc have all won championships on team orders, anybody care now?`Because Mike Mosley changed the rule (hes a complete idiot) everyone is getting upset? You spend 300 million dollars for a season and then gamble everything because of "fairness" or "he deserves it". When redbull has as many titles as Scuderia, then come talk again. Ask the drivers who they think is the best among them?. The answer is Alonso. PERIOD. I dont think Alonso is a good driver at all, he dont play by the book. Look at him this yr, the team order was issused so that he can get 7points more than his team mate so that he will have a higher chance of winning the title. Therefore he is just a guy who needs others support him or cheat then he will win. I think other drivers are much more better than him! He is the best PERIOD!! He took out Schumi and Kimi while driving a lesser car in 05/06 and he'll do it again to Webber/Vetel on '10. Definitely alot of Alonso haters and LH supporters on here..but the fact is, Alonso driving the 3rd or 4th fastest car (behind the 2 Redbulls and McLaren, occasionally) is now leading the championship. Don't forget, many teams and pundits wrote of Alonso and Ferrari midseason, when they were penalized and had a series of bad luck. Afterall that, he is still beating the Redbulls, so clearly he is more talented than the rest. Technically, the top 4 drivers could be on par but he certainly is able to pull the whole team behind to create wins and opportunities, which other drivers might not have been able to do given the circumstances Alonso and Ferrari faced earlier in the season. So , regardless of your views, Alonso is still mentally the strongest of the lot out there and that is why he is still leading in the final race, I hope he wins it even by 1 point because I think he deserves it !! Without his maturity, WC winning exp, and driving skills, Ferrari would not be where they are now. Hes definatley not the best driver as Hamilton proved by easily beating him his rookie year. His 2005 championship was won simply because Raikkonnoen broke down 6 times while leading the race and his other championship was won because he had the best car. And as the season finale proved hes a poor port as well.